Vadodara police is taking the help of latest technology to catch the people not obeying traffic rules and send e memos to their registered addresses. However sometimes blunders happens in spite of using the latest technologies by the traffic police in the city. Such a incident happens in the city when the department send a e memo to a car driver for not wearing helmet during driving. The surprising part was the mentioned car in the memo is not belonged to the owner receiving the e memo from the traffic police. 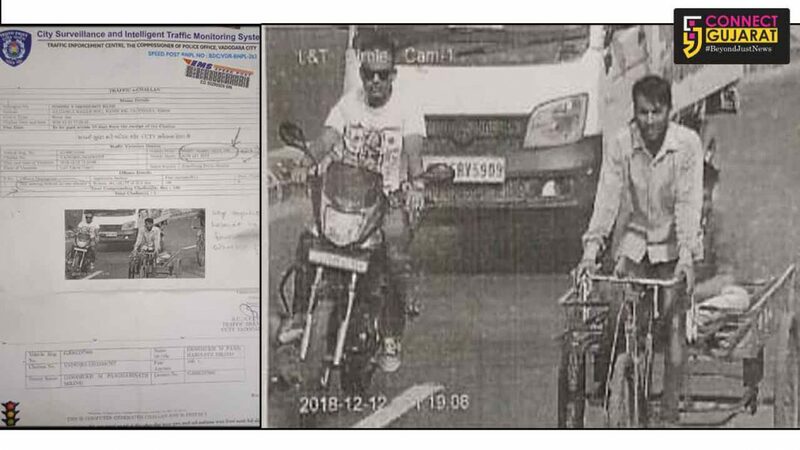 The e memo mentioned the name of the person along with the car details but the fine is for not wearing helmet during driving. The traffic police department send the memo ordered him to pay 100 rupees fine for the traffic rules violation. Milind Deshmukh said he received the e memo on Saturday at his residential address where he surprised to know about being fined for not wearing helmet during car driving. Secondly the picture in the memo was not of his car and instead he was asked to pay the fine. He inquired the matter from the traffic department but not get the satisfactory reply from them. DCP Traffic Yashpal Jaganiya said it’s the fault from their side and they will cancel the memo of the person. Few days ago the department send a e memo to the Sikh for not wearing helmet created a row in the city and now the e memo to a car driver for not wearing helmet is a serious mistake which the department has to sought out.